The last time I watched ‘Deep Red’ (or Profondo Rosso in its original title) it was on a budget disc with an OK transfer, running at about 97 minutes. I thought it was great. With this release I was able to not only see just how good the film looks on Blu-Ray ( and it really does) but to watch a far more satisfying ‘Director’s cut’ running at some 20 minutes or so longer than the original. What’s even better is that it really develops the relationship between its two principle characters much more, introducing a whole new level of humour and tension. Wonderful stuff. 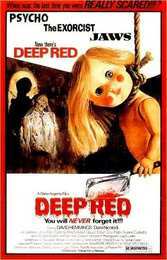 If you’ve not seen ‘Deep Red’ before then I guess you should be warned. It’s a very creepy movie which, arguably, gives Hitchcock a run for his money. Directed by Dario Argento, now rightfully acknowledged as an absolute master of the genre (Suspiria, The Bird with the Crystal Plumage), ‘Deep Red’ is almost the epitome of the giallo movie with all the right ingredeients in all the right places. Or should that be in all the wrong places? Despite ticking all the giallo boxes (raincoat and black glove wearing murderer brutally slaying people with a large knife ), nothing is quite what it seems here though so expect the unexpected. One night, jazz pianist Marcus Daly (David Hemmings, Blow Up, Lola), looking up from the street below, witnesses the brutal axe murder of a woman in her apartment. Racing to the scene, Marcus just manages to miss the perpetrator… or does he? Who is the man in the raincoat – and what seems to be not quite right in the apartment? The murdered woman was renowned for her psychic abilities but, whilst performing live in a large theatre, she picks up the sickening murderous thoughts of one of the audience. What’s more, she believes that she knows who it was, but she’s disposed of before anyone is identified. With a nagging feeling that he has seen something important to the case, Marcus takes on the role of amateur sleuth, determined to find the killer, despite putting himself in the position of being prime suspect in the process. Before long he is joined by a feisty but beautiful reporter, Gianna Brezzi (Daria Nicolodi, Phenomena) who , for professional reasons, is equally determined to find the psychic's killer. She makes it quite clear that bedding Marcus would be an added bonus, cause for much humour and frisson between the two throughout. Giordani (Glauco Mauri, L'ospite), one of the psychics colleagues on stage and a psychology professor offers to help. His interest seems highly academic but his specialist knowledge of the psychopathic mind might help. A break-through comes when Marc discovers the likelihood that the murder was a way of covering up an older crime – one hinted at during the creepy title sequence for the movie. Not only that, the killer seems to know his every move and starts to persue everyone involved in the case, including Marcus himself in what are some highly scary moments. Before long, people start getting bumped off and time is running out. 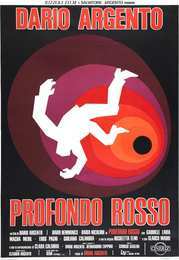 Many argue that Profondo rosso was Argento’s finest film. Having tried his hand in the non-thriller genre (with modest success) this was heralded as a great return and it really delivered. As pointed out by a critic in the extra features, Argento is far more concerned with style than substance or narrative. Except in this case you get both. He uses the murderer’s point of view camera-work to great effect and the music, if a little unusual (Italian group Goblin offering up a prog rock melt-down) just seems perfect for the film, stamping something highly unique on it. It’s typical of the confidence of Argento to go with his instincts, much to the delight of the (at the time) very young new band looking for a deal. It’s a classic score and this luxurious set comes with the score as a separate CD – although I just had a single Blu-Ray check disc for review so can’t comment. (I believe it’s been issued on vinyl recently so that may have to go on the wish-list). There are four audio tracks on this Blu-ray release: Italian DTS-HD Master Audio 5.1, Italian Dolby Digital 2.0, English Dolby Digital 2.0 (on Disc 1) and English Dolby Digital 2.0 (on Disc 2). There are also optional English subtitles for both the Director's Cut and the International Theatrical Cut. As well as the two versions of the film across two discs and the complete 28-track original soundtrack recording, the set ships in deluxe packaging including an all-new exclusive booklet, 6 x postcard set and feature newly commissioned artwork by Gilles Vranckx. Here’s a complete list of the special features, many of which are great fun. 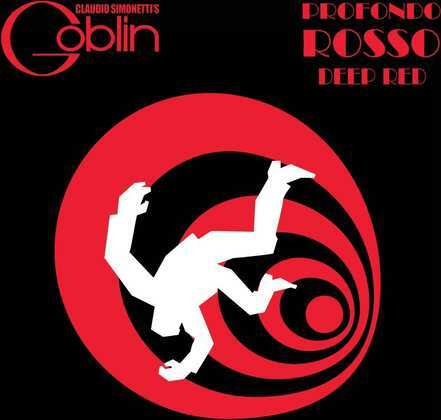 It’s great to see the interviews with the man himself but equally fun was hearing from the still-bewildered Claudio Simonetti of Goblin about his great luck at being asked to provide the score and his recollections of how that worked. Equally fun was a visit to Argento’s equivalent of a ‘Forbidden Planet’ shop in Rome. Even Directors can be collectors and fans. This is an absolute classic giallo thriller and, second time through, I enjoyed it even more, especially with the superior and lengthened Directors cut back in place. This edition is the ultimate one though I suspect its limited run will make it very scarce and very valuable in no time at all. If you want it, don’t hesitate. It’s brilliant.